I like Pelham Square. It’s quiet, it’s green, it’s sedate. It’s not raucous like the rest of the North Laine. The rest of the North Laine has always been busy and industrial and now it is busy and ‘student life’ busy, with lots of street life. This is more like a sedate aunty. We like to sit in this park and enjoy the scenery as life passes us by. We have spent many joyous moments in this park; it brings a tear to my eye just thinking about it. Please do not put up fences to guard this park as this is the only place in Brighton we can sit down and relax after college and chat about our day. I was born at no 17 Pelham Square on 21 March 1946 and lived there with my Mother, Stepfather, Auntie and Uncle, as well as two brothers and three sisters, until the age of twelve when the house was condemned and we were moved to Southall Avenue in Moulscoombe.The grassed area which is now open to the public was kept closed to the public and only used at times by the Fawcett and Margaret Hardy Schools. It had an air raid shelter in it and the only time it was used by the residents was to hold the Coronation street party in 1953. In the top corner was a lock up used by Mr Geary who dealt in second hand furniture and goods. This was later taken over by the Aubrey Press. Adams and Broadbrige were on the top corner with Trafalgar Street and the lower corner was occupied by Dr Warden who was a miserable old soul. I really miss my weekly visits to the Square. I’m doing a history project on Pelham Square – especially the garden – and I was wondering how it was used in the past. If anyone has any photographs or memories of shops etc please post on here. Thank you. In 1956 I knew a girl called June who lived in Pelham Square. I was 15 she was about 18 at the time. I worked with her at the Zylo she lived on the right hand side about halfway down. I too thought it was a pretty place to live. She married very young to Pete Harris and lived at the top of her mum’s house in the attic does anybody know where she is now? I was a choir-boy at St Peter’s Church in 1938. Other members of the Choir were Douglas Trangmar of Pelham Square and Roy Whipps of Sidney Street. Does anyone know these two? Where are they now? I am wondering whether the Roy Whipps you are referring to is my father — Roy Charles Whipps. He lived in Brighton and sang in a choir circa the time you are talking about . In 1938 he would probably have been 13-15? years old. He was in the army then in Public Relations. I would love to find out any information you know about him. He died when I was 17 in 1980. My father was Douglas Trangmar and lived at 5 Pelham Square with my mother, Lilian, my 2 brothers, Jeff and Steve, and me for many years. I moved out in 1969 when I got married and my brother, Jeff, when he got married in the ’80s. I cannot remember the family who lived at number 4 before Mrs Parry bought it but I do remember playing in their cellar. It had been cleared and painted and we used to put on plays etc all for the children in the Square. The green was always kept locked but we used to climb over and play safely. I do remember Mrs Parry at number 3 and the Humphrey family who lived at number 2. My family moved to Patcham, then Westdene where my father sadly passed away in 2006 after a tragic accident at home. Dr. Warden (mentioned above, whose surgery was on the corner of Pelham Square and Trafalgar Street) may have had a rather short fuse, but in the 1920s/30s he was our family doctor and made house calls. Our family lived in Whitecross Street, and I recall my father paying cash as the doctor left the house. In those days the grassy area of Pelham Square was locked and off-limits to “outsiders”!. I remember Irene Parry of Pelham Sqaure when she was active working for her founding charity Halo for homeless people in Brighton. I first met her in the early 1990s. She was a regular visitor to the antiques market at Brighton station on a Sunday morning, she purchased jewellery from my partner and myself and we helped her out by donating items for her charitable causes. She was a gracious and wonderful human being. I have often thought about her and was sorry to read of her passing, but I guessed that she had gone anyway. The world would be a richer place if there were more people like Irene Parry – she was truly inspirational and cared very much about others less fortunate, and was always enthusiastic about her beloved Pelham Square. Thank you for your kinds words about my Auntie, Irene Parry. She was a remarkable person and she is missed by us all, especially at this time of year – her house was at the centre of everything Christmas. I recall the cellar with a painted fireplace my mother Coral used to play there with auntie’s son viv, I also recall the Humphrey and the Trangmar families and I knew june wheeler who my Auntie liked very much but sadly i believe she has passed away. so heartening to visit the site and see all the comments.. Happy new year! My mother June Wheeler lived at 18 Pelham Square until her death in 1997 which was where she and my father Mike had retired to. 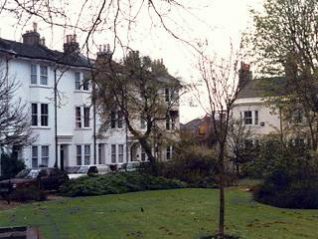 For a short while I had lived at 9 Pelham Square leaving in 1987. Many happy memories of the square apart from the problems of parking! I purchased number 5 from Doug Trangmar who purchased my house in Overhill Drive, Patcham. He and his family were great, decent people and I’m sorry to hear of his passing. As for Irene Parry, suffice it to say that they just don’t make them like that anymore. A true legend.